As Kim Jong Un succeeds his father as the third member of the country’s Kim dynasty, political analysts around the world are waiting to see if he will bring about new dialogue with the country’s neighbors or if he will continue the isolationist policies of his father and grandfather. On the last day of official morning for the late North Korean leader Kim Jong Il, his youngest son Kim Jong Un was formally named the head of state, taking over as Supreme Leader, head of the ruling party and supreme commander of the Korean People’s Army. The transfer of power is formally complete, but will this nuclear power continue to develop within its previous paradigm of tough confrontation with the outside world, or will it opt for dialogue? The rise of 29-year-old Kim Jong Un, the third ruler from the the Kim dynasty, shows clearly that the country’s ruling elite is not prepared for a change in course, even while the country itself is changing. With the collapse of the Soviet Union, North Korea lost an important political ally and economic sponsor. The archaic militarized economy stalled, and a wave of natural disasters put the country on the brink of famine, which forced Pyongyang to appeal to the international community for aid. In 1994, the countries founding leader Kim Il Sung died and was succeeded by his son Kim Jong Il, who was apparently unable to ignore the economic achievements of neighboring China, not to mention the success of South Korea. 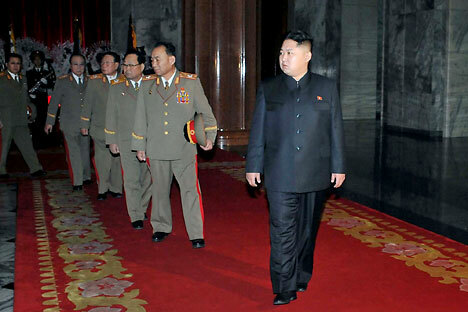 Kim Jong Il might have become Korea’s Gorbachev. He began cautious, gradual market reforms in 2002, including the creation of a special economic zone in Kaesong, allowing South Korean businesses into the country and permitting small-scale trade to develop. But Kim suffered a stroke in 2008 and, more importantly, South Korea shifted from its Sunshine Policy of cooperating with North Korea to the North Wind Policy following the election of Roh Moo-Hyun. Additionally, George W. Bush named North Korea part of the “Axis of Evil” along with Iraq and Iran. Interestingly, the situation in the country increasingly resembles that of the Soviet Union at the time of Gorbachev’s reforms. On one hand, influential government officials are getting more and more freedom to manage the state property entrusted to them. At many agencies and state institutions, firms and companies are being created that do real market business, from foreign trade to consumer services. The number of restaurants, shops and markets is also rising. “People are certainly living better now than in the 1980s and especially in the 1990s,” Toloraya said. And now, the country is getting a young leader. “In the short term, he will continue his father’s policy. At the same time, being a representative of a younger generation who went to Europe to study, he might have his own ideas about many things, and he might come up with some initiatives,” said Alexander Vorontsov, head of the Korean Department at the Russian Academy of Sciences’ Institute of Oriental Studies.“What is really vital is how the European community and North Korea’s immediate neighbors will see the country under its new leadership. If the current policy of isolation, sanctions and attempts at regime change continue, the new leader, like his father, will not be able to change the country’s domestic policy,” the expert believes. And this is the main dilemma for the U.S., Japan and South Korea. And yet, belligerence and intransigence has worked well for North Korea up to this point. It was largely due to North Korea’s uncooperative position and its nuclear arsenal that the Korean peninsula avoided war in 2010, when North Korean troops opened fire on the border island of Yeonpyeong. And shortly before Kim Jong Il died, followings talks with North Korean officials in Beijing, the U.S. agreed to provide North Korea with 240,000 tons of food aid. South Korean news agency Yonhap quoted a diplomatic source in Seoul as saying that the agreement was reached in exchange for Pyongyang’s promise to take initial denuclearization measures, including the suspension of its uranium enrichment program. Perhaps Washington and Seoul view these developments as small steps towards improved relations, but so far the world is waiting to see if Kim Jong Un will bring more of the same or change the course of his country.